Palten comes from the neighboring community of Kalapuan, just a 15-minute boat ride away from Pom Pom Island and TRACC. As a Bajau, he’s always fished and knows so so much about the ocean. At TRACC he’s a general handy man, doing all the things needed to keep camp afloat. He’s great with tools, boats, air compressors, kitchen knives, cement mixers, and just about everything else. He happily shared some of his vast knowledge with Gon and I about fishing and how his view of the ocean has changed since starting work at TRACC. Gon and Lark: I understand that fishing is part of the culture of the Bajau people and of Kalapuan. Can you tell me a little about the fishing methods of Kalapuan and your personal history fishing? Palten: There are 44 ways of line fishing, more than 20 ways of net fishing, 7 ways to spearfish, traps for prawns and lobster, and Sahat traps for mantis shrimp. There is fishing with bare hands, compressor diving fishing, and bomb fishing. To catch octopus we make a fake octopus and place it near another octopus and pull towards the surface on a line. The female octopus has small suckers on her arms and the male octopus has large suckers, if the octopus is pregnant it will have a bigger head (because of the eggs in their mantel). To catch cuttlefish we dive down and look for the eggs. The cuttlefish always lay in the same area and when they deposit their eggs in the coral the adult cuttlefish guard the area for a few days and then disappear. A few days before the eggs hatch many of the adults come back. But very close to hatching the he really big cuttlefish will be near the eggs, this is when we catch the cuttlefish. When we see a big school of fish we put a big net, maybe 100 meters with a 1000-meter rope, around the whole school and wait for the tide to go down. Then we pull pull pull to make a circle around the fish. I know all the different ways to fish. I started to fish 15 years ago and now I am 23. G & L: You mentioned bomb fishing as one of the ways to fish. Why did you use bomb fishing? P: If the area is only one or two meters it is ok for using the net so we use the net. If the site is deep and a lot of coral we cannot use the net so we use the bomb. Nets can be used in open sea or sandy places. If we go net fishing and we find a big school of fish but there is a lot of coral in that place, it will destroy the net, so we go back another day with the bomb. It is the easiest way to catch fish, because for bomb fishing because you get fish you didn’t see when checking out the place and it does not destroy the net. G & L: Did you know about the effects of blast fishing at that time? P: Yes – they break. G & L: Did you think it was a problem? P: No I didn’t. The coral is useless for us. G & L: How did it feel to bomb fish compared with the other methods of fishing like net and line fishing? P: The fishing depends on the site and the fish. The fishing is all the same. G & L: When and why did you start working at TRACC? P: June last year (2015). When Miti (another member of the TRACC staff from Kalapuan) was building his house he hired me to help him build it. Later, when Miti was making bottle reefs, he hired me to help him make the bottle reefs. When TRACC moved the camp back to Pom Pom Miti introduced me to Dino (another TRACC staff member), who hired me to work a short while at TRACC. After awhile TRACC offered me a permanent job. I am staying here to work for TRACC because it is more fun then fishing and close to Kalapuan. Before I worked in Kota Kinabalu with construction, and at a car wash. I didn’t like it because it was too far from my village. 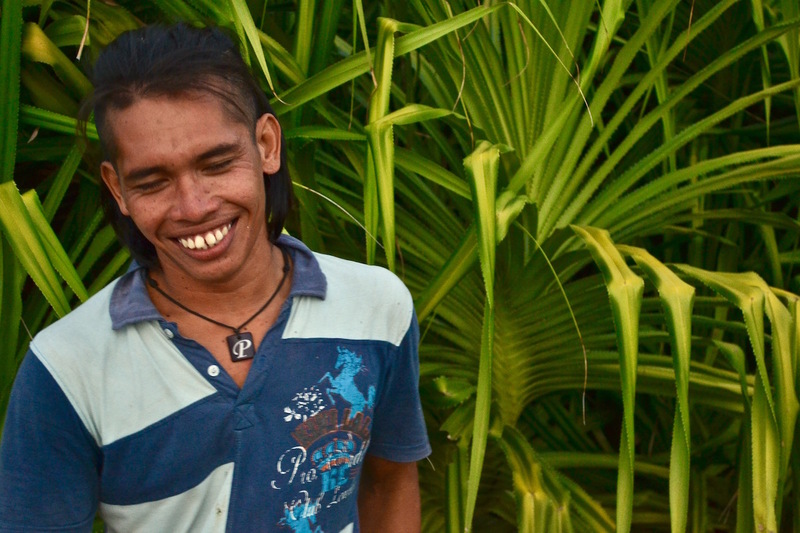 It’s hard to work in Kota Kinabalu as a Bajau and its far away from home. G & L: Do you feel connected to the ocean? P: I like to see the marine life, I can make a living from the ocean, and sometimes there are places that are beautiful. I miss the ocean when I do not see it. When I was in the city, even though I did not fish, I would walk to see the ocean. Read part 2 of the interview to discover how Palten's view of the ocean has changed since starting to work at TRACC.